This is what you always get in your batch’s Whatsapp group when OBW is around the corner right? And in the end, it always end up with the same similar faces going back to koleq. Its 90 years MCOBA anniversary! Its the Grand Final of Mcoba Football Cup! And we have the likes of KJ, Nurul Izzah and friends to join our BungWak Run! And while you are planning the trip with your batchmates, why not consider a fun way of going back to koleq this year? Skip the hassle of organizing ‘convoy’ from KL and double the fun roadtripping with your batchmates in a Starex or Vellfire all the way to Kuala Kangsar, in a group of 6 or 7 pax. We guarantee that its comfy and spacious. Comfy enough to make a pit stop to the 2nd-best Pau Yik Mun (of course they cant beat Yut Loy 😆) or Nasi Vanggey Ipoh. And spacious enough to catch a good laugh of old koleq jokes with your favourite boys in the car. Hurry, spread the words to your friends about the excitement of OBW 2019 and plan your fun trip with us now! 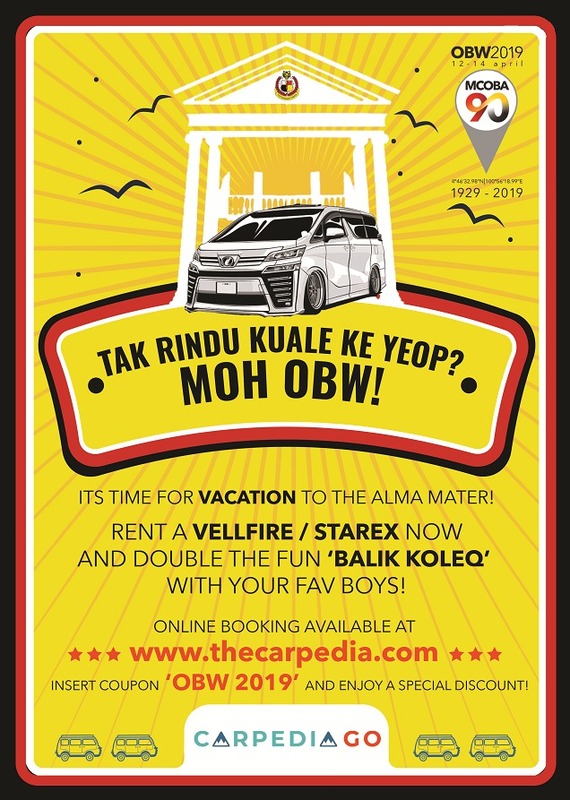 Online booking is available at www.thecarpedia.com and insert coupon “OBW2019” to enjoy special discount. Should you have any inquiries, reach us at +6019-5778108.